FundInvoice | What Is Factoring & What Does Invoice Factoring Cost? 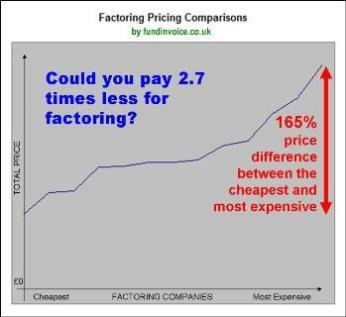 Our research has revealed huge pricing differences between factoring companies. That is why we offer a free, independent quote search for factoring. We can put you in contact with the best factoring companies in the UK, and provide expert advice. Funding - money against your outstanding sales invoices and new invoices as you raise them, providing you with working capital that will improve your cashflow..
Credit Control Support - help collecting in outstanding invoices that can save you money and time as you don't need credit control staff. Confidentiality - if you wish, credit control can be undertaken in the name of your business, so customers are unaware. Bad Debt Protection - protection against bad debts is optional if you want to protect yourself against your customers failing. The finance company (factor) provides you with a prepayment against your invoices. The prepayment percentage can be up to 100% depending on circumstances. An 85% prepayment against a £100K sales ledger could release £85K of funding. This immediate cash injection can be used for any purpose. The factor provides credit control support to save you money & time. Credit control activity can be undertaken in the name of your business. When customers pay, the balance of the invoice value (less charges) is passed to you. As you raise new sales invoices so new prepayments make more money available. In this way the funding grows as your turnover and sales ledger grows. How Much Cash Could You Raise? The amount of money that you could raise will depend upon your industry sector and the nature of your business, typically 85% of invoice value but up to 100% (less charges) in some sectors. Find out how much cash you could potentially raise with our free online cash calculator. On a selective basis (where you choose invoices to fund) you only pay for the invoices you submit, so there is no minimum cost, you pay for each transaction. If you want to fund against all your invoices, for an entire year, costs start from c. £3,000 + VAT per annum, with single fee, inclusive arrangements are available. The cost for your business will depend upon the type of facility that you want and the nature of your business. We can find quotations for you without obligation, and our service is independent. Examples of the Cost of Factoring. Alternatively, if you opt for the selective, single invoice finance option where you select the invoices to be funded and you have no ongoing committment to use the service in the future. We do not charge you to use our quote search service. We may receive a commission from the finance company, if you choose to proceed with them. However, on average we still manage to save most customers money on quotes received from elsewhere. Compare the Cost Benefits of Factoring With Bank Overdraft - a cost benefit analysis of the two options where you can enter your values to make the comparison. Research findings - results of a study where we spoke to a sample of clients that were using these services. Spot Factoring Help - where you decide which invoices you want to factor. Alternatives To Factoring - an article setting out alternative finance sources. How Factoring Works - an article explaining the process in detail.